Andre Felipe de Araujo Lira and co-workers have recently described a new species of Ananteris Thorell, 1891 (Buthidae) from the Caatinga biome in Brazil. 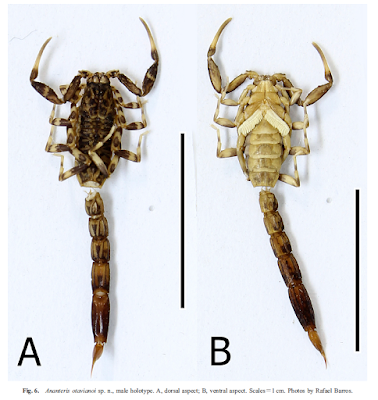 We describe a new species of scorpion from the Caatinga of the state of Pernambuco, Brazil. Ananteris otovianoi sp. nov. can be distinguished from other Ananteris by the following combination of characters: blackish brown spots up to the medical surface of the chelicerae; pectinal tooth count and some structures measurements. In addition, data on natural history are showed and discussed. Thanks to Andre Lira for sending me their article!